As far as manned spaceflight is concerned, all attention seems to be directed toward Mars, which makes sense after all considering it’s the most Earth-like planet in the solar system. It’s not as hospitable as it was a few billion years ago, though, and because of the long trip that realistically takes at least two years a lot of things could go wrong. So, why not check out the planet nearest to us – Venus. 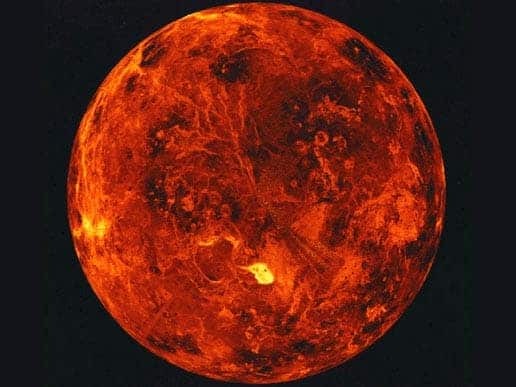 Wait a minute, isn’t Venus sort of like a physical manifestation of hell? On its surface yes, but some 50km above in its gas rich atmosphere things aren’t that much different from Earth. When you weigh in the trade offs, then a manned mission to Venus doesn’t sound that crazy, despite the challenges. 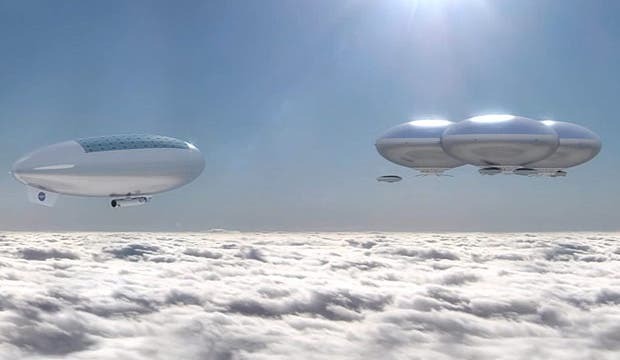 To this end, researchers at NASA’s Langley Research Center have proposed a novel idea: explore Venus’ atmosphere in a sophisticated helium filled airship. Yes, a manned crew might one day surf through the Venus atmosphere in zeppelin. You get props at NASA for being creative, that’s for sure. Moreover, if everything goes well, there might be interest to build a floating outpost that houses a permanent crew. Venus is the second planet from the sun and the closest to Earth. It’s a peculiar planet with such a slow rotational moment that years are longer than days. As far as its surface is concerned, no one would ever think about visiting it. Atmospheric pressure at sea level on Venus is 92 times that of Earth, or equivalent to that found 1 mile below sea level, and the temperature is nearly 500 degrees Celsius, enough to melt lead. The atmosphere at ground level isn’t that pleasant either, consisting mostly carbon dioxide with clouds of sulfur dioxide and sulfuric acid. Yum! In fact, this planet is so hell bound that no probe sent to the surface survived for more than an hour and we’re talking about robots here! At 50 km above its surface, Venus doesn’t look that menacing though. Pressure stands at 1 atmosphere, identical to that found at sea level on Earth, and temperatures stand no higher than 75 degrees Celsius which is a whole lot more manageable. The amount of radiation an astronaut would be exposed to in Venus’s atmosphere would be “about the same as if you were in Canada,” says Dale Arney Space Mission Analysis Branch of NASA’s Systems Analysis and Concepts Directorate at Langley Research Center, in Virginia. That’s because the upper atmosphere of Venus is “probably the most Earth-like environment that’s out there,” making for a great shield against charged particles expelled by solar winds. Mars, on the other hand – everybody’s favorite – has an extremely thin atmosphere. On Mars, unshielded astronauts would be exposed to about 0.67 millisieverts per day, which is 40 times as much as on Earth, and they’d likely need to bury their habitats several meters beneath the surface to minimize exposure. Also, Mars’ “sea level” pressure is 100 times smaller than that of Earth, while its gravity is a third of Earth level. Concerning temperature Mars stands at an average -63 °C, which is also manageable. Maybe the most important thing that sets the two planets apart is the distance from Earth. 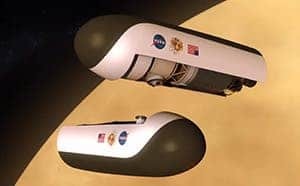 While on any given orbit, a manned mission to Venus would take 440 days (110 days out, a 30-day stay, and then 300 days back with the option of aborting), the same mission to Mars would take 500 days in the happiest scenario or, realistically, 650 to 900 days depending on the orbital alignment. Not to be neglected is also the incoming solar flux that each planet receives. Thanks to its close proximity to the sun, Venus receives 40 percent more solar energy than we get here on Earth, and 240 percent more than we’d see on Mars. This make it a whole lot easier to power instruments. With the right context in place, it’s time to talk a bit about the High Altitude Venus Operational Concept (HAVOC) mission proposed by NASA scientists. HAVOC is in fact a series of missions, which starts with a maiden voyage involving a robot that would test out the atmosphere. If conditions are ripe, a crewed mission to Venus orbit will follow with a stay of 30 days, and then a mission that includes a 30-day atmospheric stay. Ultimately, a two-person crew would spend as much as a year in the Venusian atmosphere, most likely in permanent outpost similar to a floating cloud city. 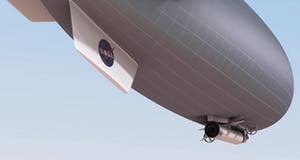 The exploring will be made in a helium-filled airship which for the crew mission might be 130 meters long, or twice the size of a Boeing 747. 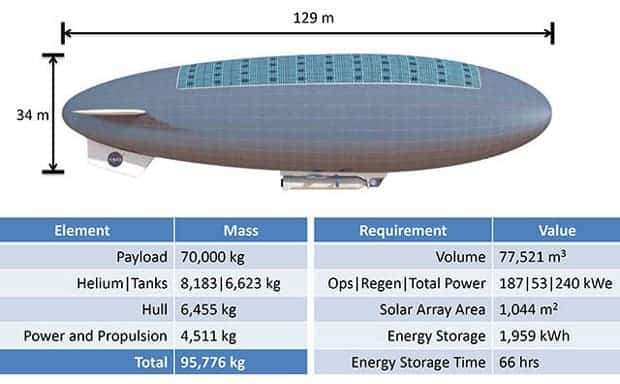 More than 1,000 square meters of solar panels would cover the top half of the airship, which considering the high solar flux might be enough to even power on-board turbines used to propel the ship. Deploying an airship on Venus is not easy task, though. First, the aeroshell would enter the atmosphere at 7,200 meters per second. Over the next seven minutes, it will decelerate to 450 m/s. At this stage, a parachute will be deployed to further slow down the descent. 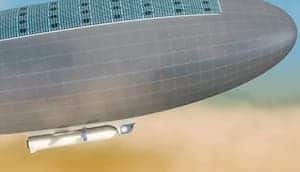 While stopping dropping like a dead weight at a whooping 100 m/s, the ship will finally begin to inflate – eventually, the lift and drag will stabilize to the point the ship begins to float, stabilizing at 50 km above the surface. A crew habitat would then launch from the Venus orbit in a craft based on NASA’s Deep Space Habitat, rendezvous with the airship and enter it where they will be busy performing science experiments for the next 30 days. When it’s time to head home, the astronauts would get into a tiny capsule on the front of the rocket, drop from the airship, and then blast back into orbit. Sounds simple? Stage 3: crewed mission stays for 30 days in airship. Stage 4: Crewed mission stays in Venusian atmosphere for a whole year. Mars, of course, has the advantage of being able to explore its surface. It’s also the only planet that actually has a chance of being terraformed, ultimately one day becoming a second Earth, so there’s a great deal of interest in exploring Mars. While the Red Planet has seen over a dozen probes graze its orbit, Venus has stayed largely ignored. The truth is there’s a lot we can learn from both planet, so why not do both? I know… money. “If you did Venus first, you could get a leg up on advancing those technologies and those capabilities ahead of doing a human-scale Mars mission. It’s a chance to do a practice run, if you will, of going to Mars,” Arnie continues. At this stage, HAVOC sounds really interesting, but personally I feel it will take a lot of convincing to shift NASA’s plans and priorities away from Mars. It’s a really nice project, though. Who knows, maybe 2030 onward we might actually see it happen.